When Batom’s editor, Brady Wentworth, realized that the new writer he was enamored with, Mitchell Knox, was a fifteen-year-old boy he was infuriated. He felt that he had been conned and that Mitchell had misrepresented himself by not revealing his age upfront. Brady ushered the boy’s mother into his office leaving Mitchell to cool his heels in the bullpen. He then commenced to grill Mrs. Knox as to who had really written and laid out the Charlie and Chuck story. Mitchell’s mother assured him that the work had all been done by he son as he sat at their kitchen table at home. Further, she said that Mitchell had a sketchbook full of other characters and ideas. As time went on and Mitchell developed more of his ideas for Batom Comics, these characters would become known around the Batom bullpen as the “kitchen characters”. 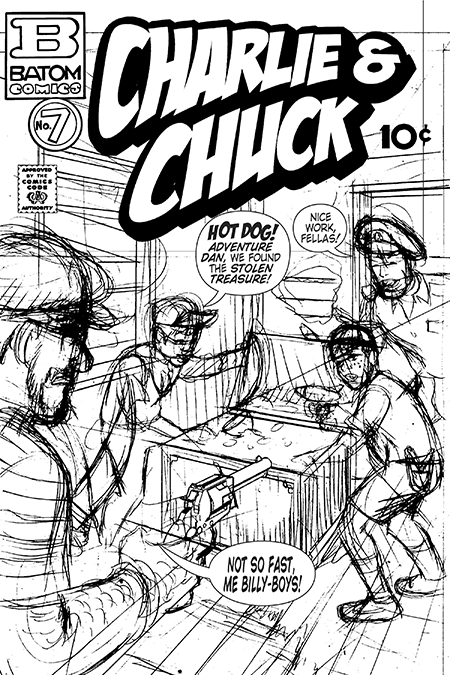 Brady emerged from his office to find Mitchell, or Mitch as he had already been nicknamed by Flash Freeman, talking animatedly with artist Phil Holt as Phil worked on the next Starbuck Jones cover. His fears assuaged and his interest piqued, Brady had apparently resigned himself to the fact that his new writer was still in Junior High. Brady told Mitch that, in spite of his age, he was going to treat him like he treated his adult creators. Mitch would later laughing say that Brady obviously meant that he would be as abusive to him as he was to everyone else. So while Mitch’s mother went shopping at Higbees a couple of blocks away, the editor and his young protegé sat done to pour over his first script which Brady now characterized as f***ing retarded, but which could be salvaged with Brady’s expert help, thus setting the pattern for their working relationship for the immediate future. All that would remain would be to find an artist for the forthcoming adventures of Charlie and Chuck.